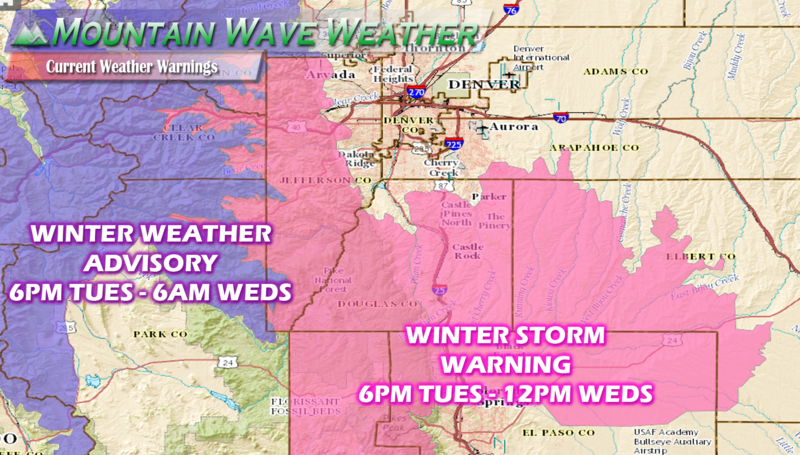 A Winter Storm Warning means significant amounts of snow… sleet…and ice are expected or occurring. This will make travel hazardous or not impossible at times. 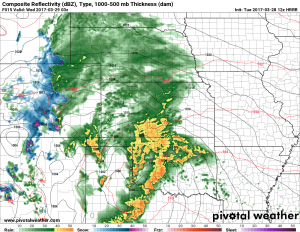 This specifically means what to expect in Castle Rock, Larskspur, Franktown, Elizabeth, Kiowa, Monument and surrounding areas out towards Limon. Expect a chance of rain and possible thunderstorms across the area during the day Tuesday. 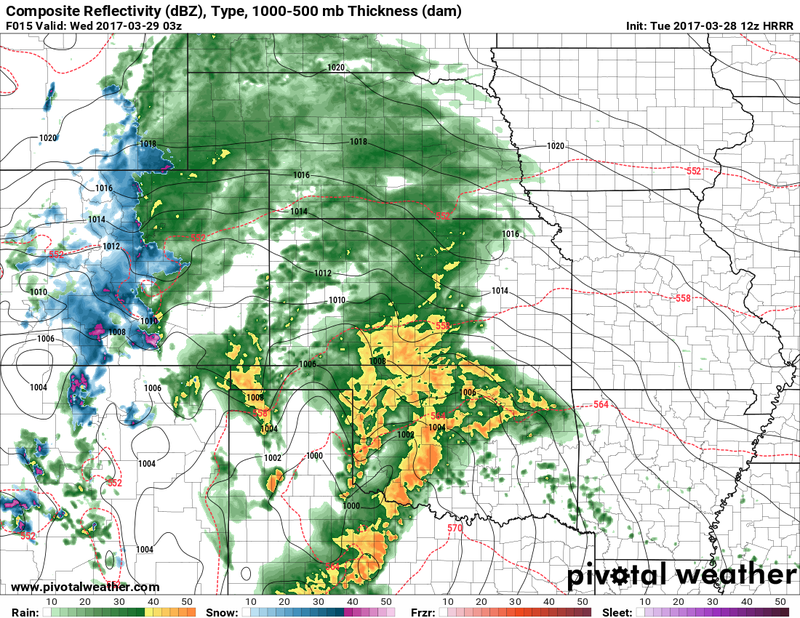 Precipitation beginsto fill in after 3pm across the front range, starting out mainly as rain. Precipitation will transition to snow around 9PM, there will be sharp rain/snow gradient so some areas may take longer to transition to snow. 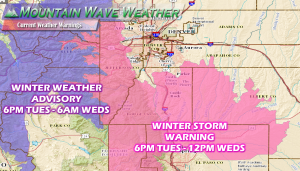 The storm should begin to move out by late Wednesday morning into Wednesday afternoon. Heavy snow, especially after midnight into the early morning hours of Wednesday will make travel difficult. Road closures will be possible in some areas. Just like the past storm there should be a pretty wide range of snowfall amounts based on where the rain/snow line sets up and how cool our temperatures get. 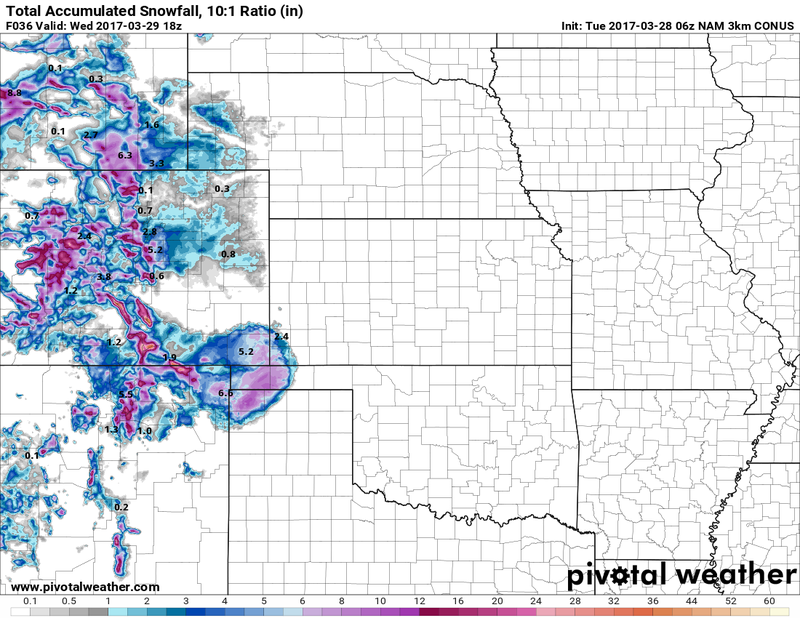 Models are in relatively good agreement on decent snowfall along the Palmer Divide, just as they were on the last storm. The difficult part here is that models can struggle when temperatures are this close to freezing but not quite that cold. 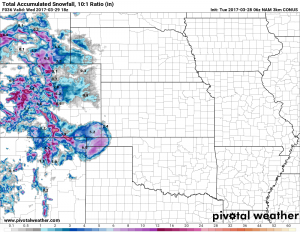 We saw this in the last storm where Northern areas of the Palmer Divide saw significantly less snow and more melting than areas just 10-20 miles South. We will continue to keep an eye on this to see if we have any changes through the day Tuesday. For now, expect a soggy day on Tuesday with mostly rain earlier in the day and snow in the evening. Probably best to have travel wrapped up by no later than 9PM tonight and expect the potential for tough travel conditions on Wednesday morning, especially South of Denver. Data straight from our weather station in Castle Rock. Phone apps and TV stations get their data from Centennial Airport, not us!